The demographic shifts due to the continued increase of our Latino populations have become recurring talking points over the years and it is not uncommon for them to appear as some form of topic in conversation ranging from general consumer confidence to ecological stewardship, international trade policy and cultural equity, electoral politics or economic inequality, and, of course, our own field of arts and cultures. Artists and advocates took part in our Miami Regional Arts Training Workshop at the end of January in Miami, saying they left both inspired by the progress and resolute to continue to advocate on behalf of themselves and other Latino artists. See photos online and hear more what participants thought of the Miami gathering. And, be sure to make plans to join us for our Detroit Regional Arts Training Workshop on June 5-6. Registration is just $20 for members and $40 for future members, and can be made online right now. The e-Boletin doesn't write itself (wouldn't that be cool if it did?)! We've added two new people to our team of communication professionals to share the amazing work happening in the Latino arts field. Meet Claudio, Jody and Ted, and reacquaint yourself with our other staff members. 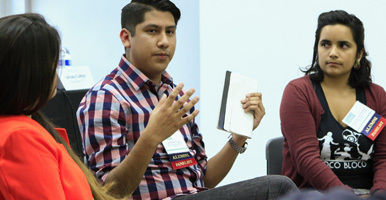 Don't wait to apply for a rigorous weeklong leadership program that strengthens core capacities in the areas of arts management (including artist and organizational development) as well as building knowledge in the field of Latino artistic expressions, research and policy to prepare creative, strategic and nimble cultural leaders. Applications are now available online and must be completed by February 27, 2015. This year's institute will be held July 13-18 in San Antonio, Texas. We've simplified our process to apply for a NALAC Fund for the Arts grant, which assists US-based Latino artists and arts organizations in the development, creation, presentation and sustainability of artistic excellence. If you are an artist, ensemble or organization that has demonstrated artistic excellence in pursuit of social justice through the arts, all you need to do is submit a Statement of Intent by February 19, 2015. Learn more and submit your statement today. A new San Antonio Artist Grant, supported by the City of San Antonio Department for Culture and Creative Development, is open to residents of San Antonio, Texas. Grants of up to $5,400 are available to San Antonio artists. Learn more and submit your Statement of Intent today. Photo credits (top to bottom): Participants of NALAC Regional Art Workshops in Providence, Rhode Island by Luis M. Garza, NALAC Program Associate; Participants of NALAC Regional Art Workshops in Miami, Florida by Luis M. Garza, NALAC Program Associate.